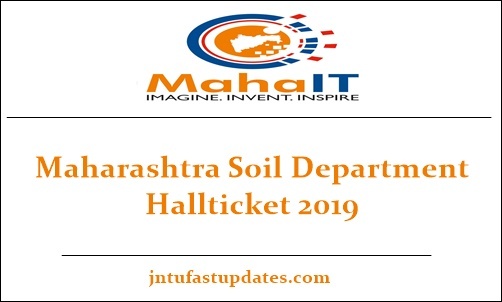 Maharashtra Soil & Water Department Hall Ticket 2019: Maharashtra Soil Department is going to organize the water conservation officer shortly. All the competitors applied for water conservation officer posts in Maharashtra can get ready for the written test. As per the information from various sources, this year the competition is higher for Maharashtra water conservation officer posts. In order to get the job, aspirants need to score the best in the written test and interview rounds. Selection of candidates will be done on the premise of merit. Candidates with good merit will be given top priority for appointing in WCO posts. Candidates have to initially qualify the written test round with good merit and then they will get the chance to appear for the interview round. Candidates clear the interview round with good merit will be finally placed in WCO posts in Maharashtra Soil Department. Candidates who have already allied for WCO posts and waiting to download admit cards can visit the official website of Maharashtra Soil Department, mahapariksha.gov.in. Soon the department will unveil the download link. Note: Soil and Water Conservation Department exam hall ticket will be available on Mahapariksha portal for download from 23rd Jan, 2019 onwards. Maharashtra Soil Department is the state government department that offers services in water and land-related issues. This organization releases various notifications to hire the suitable aspirants based on the requirement. Recently, Maharashtra Water Department has advertised 282 water conservation officer posts and accepted applications in the month of January from eligible and interested aspirants. Thousands of hopefuls having the suitable qualification have applied for Maharashtra Soil Department jobs. Candidates will be shortlisted on the basis on merit. Candidates have to qualify the written test and interview rounds to get the job as a water conservation officer in the state of Maharashtra. Hopefuls going to attend the water conservation officer written test can get their admit cards before 10 days of the examination (approximately). Aspirants who are going to attend the written test can download Maharashtra water conservation officer admit card from the official website, mahapariksha.gov.in. Verify all the details clearly from it. Candidates can make a complaint to the department for any necessary correction of details printed on admit cards. The organization will make the necessary corrections and re-issue the admit cards to the applicants. Take the printout of the admit card for further usage. The admit card must be shown to the invigilator at the time of verification. Otherwise, candidates will be rejected to continue with the examination. Also, Carry any of the valid identity proof along with the admit card.